We like to move stuff around just as much as any American. The thing that The RE Store does differently is that each load that we carry on our trucks save precious building materials from the brink of doom by way of landfill or incinerator. It is a lot of work and we love it. Our crews drive over 100,000 miles each year if you combine all six of our trucks that roam throughout Western Washington and occasionally East of the mountains. We have our weekly “truck love” maintenance schedule that insures our trusty steeds stay watered, fed and in as good a condition as we can keep them. Neither of the Seattle trucks have a lift gate. We use ramps or brute strength to get everything on and off and on and off and on and off every day. The trucks have hauled materials from job sites that include homes, businesses and storage facilities. We carry amazing reuse displays to trade shows or haul our Recycled Art Station to community events. The trucks have even hauled tons of trash picked up from our beach clean-up projects as a part of the annual Recycled Arts Show. We utilize biodiesel in our diesel trucks and work to minimize storm water run off from our job sites. 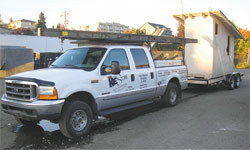 Lily is a 2000 Ford F250 Crew Cab pickup with over 133,000 miles. She is lily-white and is the truck that up to six of our Bellingham crew travels in. Lilly witnesses the most progressive conversations and brainstorms, due to her community-building roomy interior. She also carries lots of tools, but not a huge amount of materials. She loves to pull trailers and heave large timbers on her beefy rack. We wonder if she is a pig at heart, as she gets stuck in the mud all too often with her out-of-commission four wheel drive. Lilly has has spent a lot of time on overnight projects out in the San Juan Islands. Bellingham crew member, Charlie Myers, slept in Lilly’s back seat on a Lopez Island job site for four nights. His tent had collapsed under a downpour, so he made due in Lily. 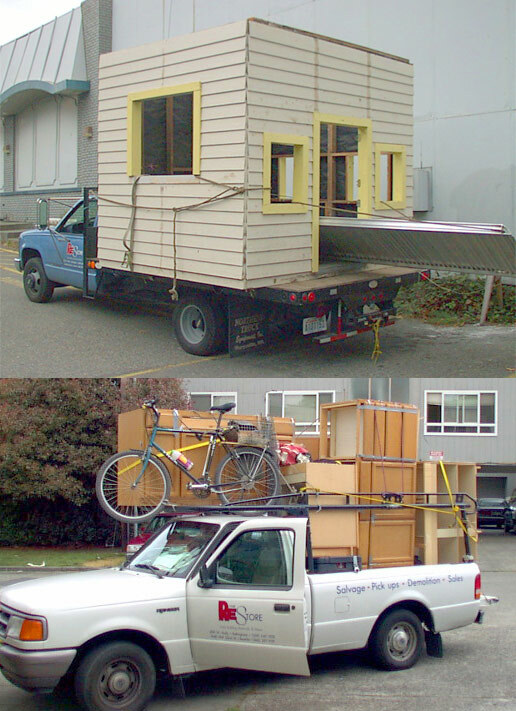 Herman is a 2006 GMC-Isuzu 12-foot box van with over 137,000 miles. Herman is the heavy lifter with a lift gate, allowing one crew member to do a lot of work and keep stuff dry. Herman is our workhorse and is the newest member of our fleet. He was an exciting replacement, 2 years ago, for our old open bed pickup, Graywolf. He is named after Mt. Herman that located close to Mt. Baker (big and white). Some of our staff wonder if Herman has a crush on Lily. Blue is a 1997 Chevy 3500 with a 12-foot flatbed, the oldest and most tired of our hard-working Bellingham fleet with a whopping 187,000 miles as of October 2012. Blue has hauled millions of pounds (seriously) of lumber and large items back from thousands of job sites over the years. You name it, Blue has carried it. We have rebuilt the gates twice that close in the sides out of bleacher boards and rebuilt the bed once, out of salvaged 2×6 tongue and groove decking, all on our own. When Blue’s rear steel gates went missing, former crew member Gabe Gonzalez welded up new ones for us. Possum is a white, 2001 Isuzu flatbed with over 120,000 miles on the odometer. We have had Possum for close to a decade. He was named Possum because a possum was living in the Seattle store that evaded capture for weeks. This trusty steed has hauled from more than 2000 job sites. Every brick load over the last seven years came back to the Seattle store on Possum’s strong back. Possums gates are made out of our bleacher board and the deck currently needs replacement, like Blue received. 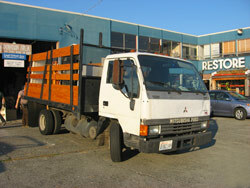 Fuso is a white 1994 Mitsubishi flatbed that we put a dump bed on with 175,000 miles. Fuso has been the main green demolition / deconstruction truck thanks to the dump bed that we installed after buying it in 2007. 15 or more houses have been deconstructed and hauled back to the store in Fuso. This is our only Seattle truck with a working radio, and it rarely is changed from KEXP or KUOW radio stations. Fuso’s side gates are also built out of our favorite wide-plank lumber material, bleacher boards. These bleacher boards sport a patina that could only be created by decades of wiggling and giggling adololescents during their school assemblies and sports events. 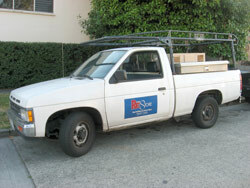 Clutch is a white 1989 Nissan pickup that was donated to our organization in 2002 with over 160,000 miles now. Clutch is the scout for our Seattle field services and sees the most mileage of all of our trucks. This old friend previews between 1200 and 1500 jobs. Clutch doesn’t have a working radio, so Clutch hears a lot of Joel, our Seattle field manager, talking to himself. Clutch proudly wears the rack that lived formerly on our previous preview rig, Scout. Before serving The RE Store, Clutch was used by our parent non-profit, RE Sources, for hauling recycling education materials to hundreds of Whatcom County school classrooms. Check out this great examples of alternative transportation in the construction industry with local remodelers, A-1 Builders, in Bellingham, commuting to a major remodel job site via bicycle. Read the article on page 16 of American Bicyclist.